Well, this week brought the DVD release of “Superbad,” and Wal-Mart has an exclusive, two-disc special edition. While the special edition offers a lot more bonus materials to watch, there’s something else in the box that is causing a great deal more excitement. 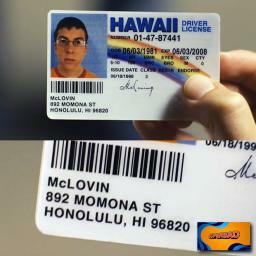 It turns out that in addition to the extra DVD, buyers get a fake Hawaii driver’s license all their own. And while a good look at it would quickly reveal that it’s just a funny novelty, Hawaii officials aren’t laughing. The KITV story noted that the city was planning to look into whether it had any recourse in contacting the DVD set’s manufacturer. And whether or not they do, it seems the controversy was enough to cause at least one local Wal-Mart store pause. I know this because I braved the maelstrom that is Wal-Mart in December last night, only to find that the “Superbad” special edition had been pulled from the shelves. Only the empty slot and price card remained. The Wal-Mart electronics manager told me they were told not to sell it until further notice, cheerfully adding that the price would not change if it was eventually put back out on the floor. Not surprisingly, I now want to get my hands on this thing even more. It’s hard to say whether this local flap will just blow over, or if it’ll snowball into a full scale national recall. If you catch the “Superbad” two-disc special edition at Wal-Mart somewhere else, let me know! HAHA, what a way to get some publicity. I bet those id’s are on Ebay already for a ton of cash. I’m def. gonna go hunting for this disc now. Will let you know if I find it! A follow-up report on KITV suggests that Wal-Mart is recalling the DVD set nationwide. D’oh! Anyone live near a Wal-Mart that might not have gotten the memo yet?